Bayre's thorough grounding in classical prototypes is evident in this highly charged representation of an incident from the battle between the Lapiths and the Centaurs described in Book XII of Ovid's Metamorphoses. Bayre surely knew the series of metopes from the Parthenon depicting the Greek legend, but the death blow delivered by the Greek hero is recognizable as a borrowing from the marble Hercules and a Centaur by the Mannerist sculptor Giambologna in Florence. 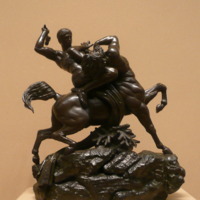 Antoine-Louis Barye (French, Paris 1796–1875 Paris), “Theseus Fighting the Centaur Bianor,” Mapping Mythology: A Digital Collection of Classical Mythology in Post-Antique Art, accessed April 22, 2019, http://www.mappingmythology.com/items/show/88.